I'm always looking for simplicity in games, especially the lighter ones. Much like the mathematical proofs I studied in the yesteryears of my graduate work, the simplest were always the most elegant and the best. This to me is what makes quickie games like For Sale and Coloretto so wonderful - rules in under a minute but some definite thought involvement. 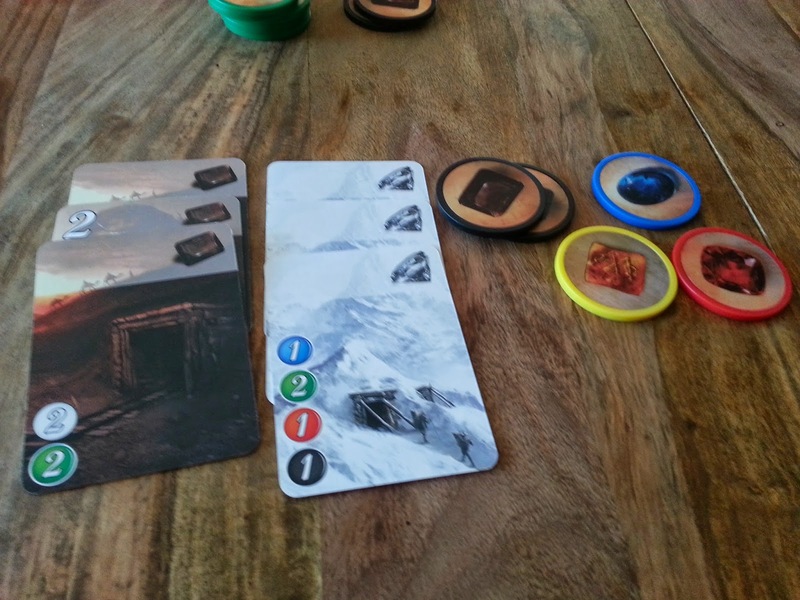 Splendor is like that - easy to explain and short enough (with the right players) and it seems like it's got some depth. And it does if you look for it. But I would argue one can just as easily play this fun game with nary a plan and still walk away handily with the victory. And therein lies my disappointment although I do think its enjoyable enough filler if its played very quickly. If a gamer was asked what an engine-building game is, they might say something like, "it's a game where you get resources to buy things which generate more resources and maybe points." Using this description, Splendor really is an engine-building game boiled down to its purest, purest essence. There are gems of 5 types which let you buy cards which then give you permanent gems and eventually, on the more expensive cards, points. And that's about the gist of the game. First player to 15 points shouts hurrah and shuffles up for another round. It's almost that simple. Okay, there's some bonus tiles which you can claim if you get enough cards of certain colours but there isn't much else to it. On a player's turn, you can take 1 of the following 4 options: take 3 distinct gems or 2 gems of the same colour (if there's still at least 4 of that colour left) or hold a card for later and take a wild chip or buy a card from the table or their hand. So you can pick up and hold up to 3 cards for later purchase? This is key because I think this is where the major problem with the game exists. In my experience with Splendor (including a 5-game bender a couple Saturday nights ago), the 4th choice of action - to hold a card for later and take a wild chip - is completely sub-optimal and one can win easily without ever doing it. I honestly wonder why the option is even there if it so useless until perhaps the final turn to clinch the victory. I've now played a few more games since then, refusing to ever pick up a card and only gathering gems when a table purchase is not possible. And I've won them, in one case quite handily. Part of the issue is the cards revealed are always so random that if you keep a spread of colours you're almost always able to buy something. If not, just wait till the next turn and something will probably come up. The luck factor is unfortunately quite large in this one. It's too bad because this really is an enjoyable and speedy (if somewhat generic) little game which seems at first glance to offer lots of decisions. I will say that I have only played my 10+ games with 4 players so we cycle through the decks very quickly. This probably allows for many cards to be purchased quite easily. I imagine in a 2-player game one would have to plan a little further ahead as the cards wouldn't get cycled half as much. Clearly if I've played more than 10 games of this, it's a nice enough diversion (especially for lunch hours at work). And I'll probably play it a few more times. But the "holding" option and gold gems are entirely superfluous and one can very easily win this one by just waiting, hoarding chips, and buying the first cards that come up. The last game I played, I spent my first three turns reserving cards and then focused the rest of the game around those three. I won handily. I've seen a game won by never reserving and just going for large point cards, and a game won by who got the right noble. I haven't noticed too much of a luck factor so far, but then I've only played with 2 and 3 where the cards stay out longer. Yeah, with 4 players, sitting and waiting for whatever cards you can buy automatically is a perfectly viable (and winning) strategy. There's just enough churn in the cards. It's too bad. I suggested the flaw to people at GoF and people who played 10-15 times all said that was not a dominant strategy. Just an easy strategy that might win with new players who don't maximize their engines. All said if you know how to build a solid engine and beat people to the nobles, then the strategy you suggest is too random and inefficient to win. barbour quilted jacket sale barbour sale uk the bottle exploded, broken glass off the floor, great sound heard throughout the bar, guests gaze at barbour quilted jacket sale the same time all transferred to cheap body. barbour quilted jacket sale They are barbour quilted jacket sale many, the results to us. When it comes down behind a small voice, totally not a tough barbour quilted jacket sale start. cheap frowned up, lift up his forehead bangs children, he took a bottle smashed on the wall, still clutching the hands of cheap remaining half of the barbour quilted jacket sale bottle, the bottle left off sharp edges, hanging above the clear liquor, and occasionally reflects a barbour quilted barbour sale outlet jacket sale bunch of lights, shining bright chilling. Thank you for providing a forum for discussing this topic, although I think you got many things very wrong. I'll send my message in several parts, because it's quite long. One thing I do agree with is your definition of an "Engine Game" as "a game where you get resources to buy things which generate more resources and maybe points". Yes, that's a good definition, but I would not call "Splendor" an engine game. When I first started playing this game, I played it like an engine game. I bought lots of the low level cards that don't give victory points, I built up and engine, and later used the engine to get victory points. That seemed to work okay. I won some games, because everyone else was using the same strategy. Then I met someone who used a completely different strategy. It seemed like he was doing everything wrong. He went for the victory points right from the start and didn't seem to be making any effort at all to build an engine. He would reserve certain high-point cards in the first few moves before he had actually bought any cards at all. And he won by quite a large margin. I thought about it for a while and decided to use this strategy myself, and it really seems to work very well. It seems that a player who goes immediately for the cards that give points will usually win over the player that tries to build up an engine. I agree that simplicity is a good thing, and in some ways "Splendor" is a simple game, but if you say that it's "an engine-building game boiled down to its purest, purest essence" then you really don't understand the game. 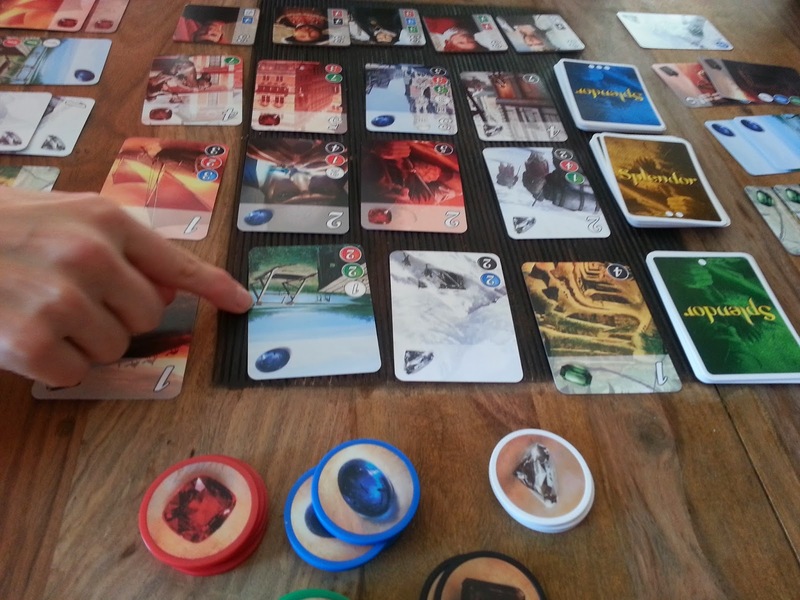 There are some games, such as "Saint Petersburg" or "Dominion", where you do need to gain the resource cards first, and then go for the point cards later, but "Splendor" is not that kind of game. In "Splendor", certain cards are strategically important because they allow you to get a large number of points for a small number of gems. Typically the most valuable cards in this category are the ones that only require a single kind of gem. How important these cards are depends to a large extent on what other cards are available that will help you get these high value cards. It's a good strategy to reserve these high value cards and the cards that will help you get them. You might argue that this is an inefficient strategy. Isn't it better to build up an engine first and just use gems to buy the card? If you reserve the card, you just get one gold piece, while if you're always taking gems you get three things. Why take just one when you can get three? The answer is that if you are going to get a card that requires six or seven gems, then the most efficient way to do it is to use gold. 2. The new cards that appear whenever one is reserved or bought. Suppose that all of the players are trying to build engines, and all players try to buy the cheapest cards that are immediately available. Then the players that have the luck of being the first ones to get the cheapest cards at the start, or if they are the first ones have the opportunity to buy cheap cards when they appear, then they have a better chance of winning. But suppose at least some of the players aren't trying to build engines. Suppose they are going for the prestige points right from the start. Then they have to decide which card is the best one to reserve, and that's not so easy. They also have to decide when is the right time to buy or reserve a card, and that takes skill. It's simple to see which card is the cheapest but more difficult to decide which high point card you will be able to buy after five or six turns. 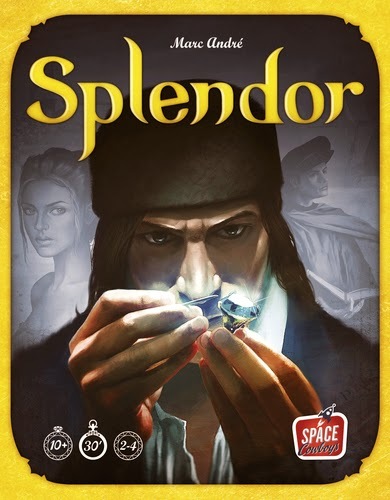 In conclusion, I think that "Splendor" is only superficially similar to "Engine Games" like "Saint Petersburg" or "Dominion". 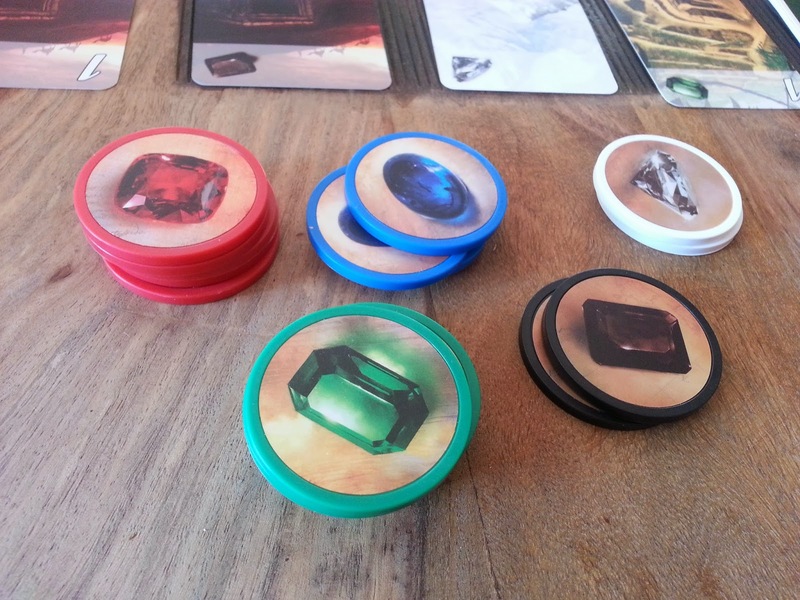 I do like these other games a lot, but "Splendor" is a different type of game that has its own value. Again, thank you for providing a forum to discuss one of my favorite games. What nobody has mentioned above is the advantage of seeing the other player's cards/gems. It's not nice but sometimes advantageous to reserve a card to prevent an opponent from obtaining it.